Bootstrapping is a popular resampling method for estimating the sampling distribution of a statistic. While the theory behind resampling methods dates back to Sir R.A. Fisher, bootstrap resampling was first proposed by Bradley Efron in the 1970s. Bootstrapping involves repeatedly sampling from a data set, with replacement, in order to form new data sets of the same size. This approximates the process of taking repeated samples from the target population. The end result is a large number (hundreds or thousands) of bootstrapped samples, which can then be used to estimate the standard error and confidence intervals for nearly any chosen statistic. Bootstrapping is a nonparametric approach, which doesn’t require distributional assumptions or theoretical calculations and is available for even the most complicated estimator. As a result, you can use it to estimate confidence intervals for wide variety of population parameters. For these same reasons, bootstrapping is also gaining popularity in statistics education, as an intuitive and more direct approach for teaching concepts of inference. In JMP Pro, bootstrapping is available from nearly all reports. The two exceptions are Time Series and analyses using Restricted Maximum Likelihood (REML). 1. From an analysis platform report window, right-click on the report of interest and select Bootstrap. In this example, I use the Distribution platform and bootstrap the statistics in the Summary Statistics report for a continuous variable. 2. 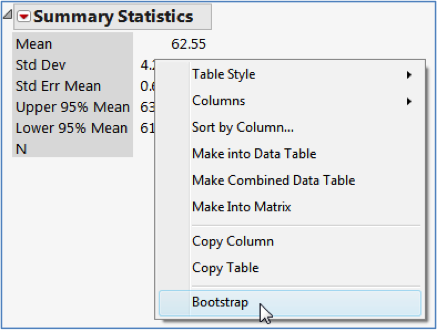 In the Bootstrapping window, click OK. JMP creates a data table (below) with statistics for the original sample in the first row (excluded) and each of the bootstrap samples. The BootID• column identifies the bootstrap sample number. 3. Use the Distribution platform to explore the statistics of interest for the bootstrap samples. Bootstrap percentile confidence intervals for different confidence levels are provided. Note: Advanced bootstrap methods are available in the Partition and Neural Platforms in JMP Pro. For more details on bootstrapping in JMP Pro, including information on options in the Bootstrapping window (above), search for Bootstrap in the JMP Help or in the book Basic Analysis (under Help > Books). Bootstrapping is one of the many topics covered in the JMP Learning Library. To download or view one-page guides, tutorials, short videos and other resources, visit jmp.com/learn.